Many viewers were veteran TVB series fans and were more than curious about Lam Fung's villain debut. They were surprised. Speaking of how to grasp the "deranged" character's state of mind, Lam Fung said that before the performance he was a little worried. However with Goo Jai's help many scenes were performed very successfully. He joked, "I finally got my wish of playing a deranged character this time, actually it can be considered a 'natural performance'." Lam Fung also revealed that he hoped through his first villain role for everyone to be able to hate him. Many asked about his upcoming film projects. Lam Fung said that no matter what types of film they would be, the productions have been a "double harvest" of pain and joy. Lam Fung continued that for several seconds that appeared in the story the team would need to spend most of the day to make. "After so many years, many films that the Hong Kong film industry have made collected a lot of blood, sweat and tears." Lam Fung urged viewers to support Hong Kong filmmakers' "craftsman" spirit and watch more Hong Kong films. Viewers who saw the premiere said that the prison scene was the surprise of the film and even praised the realism of the prison scene and the helicopter crash. Lam Fung and Tam Yiu Man who both had many prison scenes said, "The prison set was very realistic, as soon as we entered it we would feel the tension." In the film Lam Fung and Lam Ka Tung were two major forces in prison and often fought. 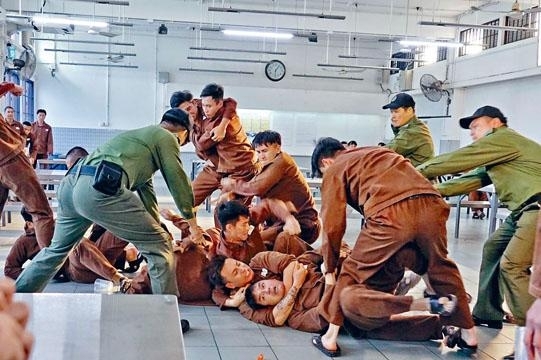 Lam Fung said that when he took the role, the director clearly told him that he would be the prison boss with a big group of fighters. He thought that someone would perform the fight scenes for him, but he did not expect that in every fight he would be leading the charge. "Everyday I had a fight scene, basically I had one with every actor." Among all the action, the cafeteria and the kitchen fights were the more ferocious. Lam Fung unfortunately took a hit to the nose. He said, "At the time the scene was very chaotic, a dozen or so people were fighting together. Fists were flying back and forth, losing slippers and breaking spoons. Sometimes I wouldn't be able to duck in time and unluckily I took a punch!" In addition Lam Ka Tung needed to get back at Lam Fung and threw an orange at him during lunch, yet he had one bad take after another. Lam Ka Tung said, "At first I thought it wouldn't be hard at all, I didn't know that every orange was different. Every throw was different. The action scene didn't stump me but the oranges did!"